Amidst the silence and numbness of his disciples, both then and now, Pope Francis insisted on Saturday during an Easter Vigil Mass, Christ has risen, and this is the message that sustains hope, turning it into concrete gestures of charity. “How greatly we need to let our faith be revived! How greatly we need our myopic horizons to be challenged and renewed by this message! Christ is risen, and with him he makes our hope and creativity rise, so that we can face our present problems in the knowledge that we are not alone,” the pope said to a packed St. Peter’s Basilica on a stormy Roman night. “To celebrate Easter is to allow Jesus to triumph over the craven fear that so often assails us and tries to bury every kind of hope,” he continued. Chicago — The current polarization in the United States is the result of a "profound sickness of the soul," which is best addressed not politically but morally, through the cultivation of the virtues of a Catholic imagination, said San Diego Bishop Robert McElroy. McElroy called the current polarization "heartbreaking," contrasting it to Pope Francis' "beautiful vision of politics" in his 2015 address to Congress. "Party" has become shorthand for worldview, he said, and party identity leads to a "cafeteria Catholicism" that too often does not foster the common good. As evidence of the bitter partisan divide, he cited a survey that said 40 percent of Americans today would be upset if their child married someone from the other political party — compared to only 5 percent feeling that way in 1960. Another example is how the church's pro-life positions on the unborn as well as the poor and refugees are placed in political opposition in which both sides present "skewed distillations of Catholic moral teaching," he said. "Catholic teaching has been hijacked by those who break down the breadth of our social doctrine by reducing it to the warped partisan categories of our age and then selecting those teachings for acceptance which promote their partisan worldview," he said. What is needed instead, he argued, is "evangelization of the heart and soul and spirit of Americans to help them grow in the fundamental virtues which can orient their choices toward the common good." This "deep-level conscience formation" has been modeled by Francis, McElroy said, quoting both the pope's address to Congress and his new apostolic exhortation on holiness, Gaudete in Exsultate. McElroy also referred to Chicago Cardinal Blase Cupich's call for a "consistent ethic of solidarity," which Cupich presented in the first "Cardinal Bernardin Common Cause Lecture" at Loyola last year. ROME — It’s an incident that has caused controversy for 160 years: A 6-year-old Jewish boy taken from his family by papal police and brought to Rome to be raised Catholic after Church authorities learned his housekeeper had secretly had him baptized. Now the case has reared its head again, with new evidence that memoirs the boy wrote as an adult were altered to take the edge off his anti-Semitic views and enhance details favorable to the Catholic Church. The Associated Press has confirmed findings by Brown University historian David Kertzer that Edgardo Mortara’s memoirs were changed in ways big and small when they were translated from the original Spanish into Italian and published to great fanfare by Italy’s Mondadori house in 2005. AP found the Spanish text in a religious order’s archive this week. The alterations do not significantly change the overall thrust of Mortara’s oft-stated gratitude to Pope Pius IX for having saved his soul by removing him from his Jewish family to raise him Catholic. But they do indicate that the tale — already subjected to over a century of revisions to suit various interests — has been recrafted again. Mortara’s great-great niece, Elena Mortara, said in an interview that the change was evidence of an effort to erase the anti-Jewish indoctrination her ancestor received from the Catholic teachers who raised and educated him. She vowed to once again mount a protest if the Vatican goes ahead with canonizing Pius and urged the current pope to consider changing Church law that still says that if an infant at risk of dying is baptized, the sacrament is valid even if it was done against the parents’ will. My son, Reilly, and I went to my first Mass as I begin the RCIA process. It sorta felt like it was the first time I've been in church in about 10 years. Was this is your first Mass, ever? Or your first Mass as a catechumen? I would have guessed that you would have been invited to a Mass at some point during your discernment with Gethsemane Abbey. But I can understand how different the Mass feels when one ceases to be a "visitor," and sees the Mass for the first time with an eye toward "This could be mine!" I hope you will continue to share your journey with us.... whatever happens, you cannot go wrong in trying to seek God's will for you! And how old is your son? Del, no this isn't my first Mass ever. I attended years ago, as my wife and her family are Catholic. And I attended prayers at Gethsemani. But this is the first Mass I have ever attended intentionally, "with my eyes open", and with the idea that I have started to attend "my Church". My son Reilly is 14. It was definitely a different experience for him, but he is adaptive and respectful, and I think he was pretty intrigued. 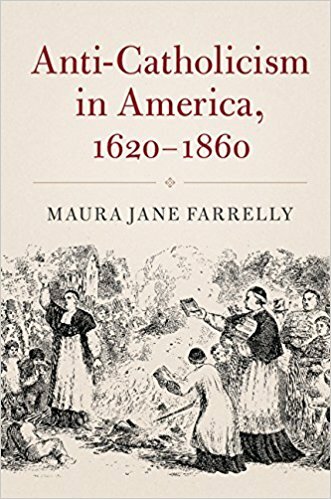 On Friday, April 27, I began my review of Maura Jane Farrelly's new book Anti-Catholicism in America, 1620-1860, focusing on the ways anti-Catholicism shaped the political culture of England and its colonies in the 17th and early 18th centuries. What is, for me, the most important part of the book is Farrelly's examination of how the stated concern of Whigs on both sides of the Atlantic to preserve "civil and religious liberties" was not a dual concern, but a single one, that the Whiggish conception of democracy grew forth from and seemed to demand a Protestant population. By the time of the American Revolution, these Whiggish ideas would be the air the patriots breathed. "Increasingly through the seventeenth century, especially during the decades that followed the English Civil War, English-speaking Protestants came to believe that governments that respected an understanding of freedom that began with individual rights were 'godly' governments, and all other governments were hopelessly corrupt," Farrelly writes. She locates this conception of a government based on individual rights in Calvinistic understandings of freedom and in the individualistic approach to divine truth that was the immediate consequence of the Protestant Reformation. The antithesis of a governmental system based on individual rights at the time was one that enshrined the divine right of kings. The king with whom the island nation and its colonies were most frequently at war was France and France was not only Catholic but it harbored the Catholic pretenders to the British throne who had been exiled by the Glorious Revolution. The colonists received anti-Catholicism as a kind of birthright of citizenship. Farrelly writes: "Fears of Catholicism — or what the colonists called 'popery' — played an important role in tipping the scales in America toward independence… The argument that 'the British government - the King, Lords, and Commons have laid a regular plan to enslave America' was asserted 'over, and over, and over again,' asserted one Connecticut loyalist." The Quebec Act of 1774, which granted legal recognition to the Catholic Church in the Canadian province, was the source of much of the patriots' concern. When the revolutionary literature frets about the danger of being enslaved, the concern is not that the colonists would wake up black and working on a plantation in the South. The worry was that the British government was tending toward "popery." Farrelly details the complete hypocrisy of the American Continental Congress which wrote to Canadians urging them to join the rebellion because the English promises of religious toleration could not be trusted, while also writing a letter to the people of Great Britain that warned the religious toleration of Catholics was a threat to English liberties. A Montreal printer published both documents together and the fraud was exposed. The letter to the people of Great Britain remains one of the high points of American anti-Catholicism, referring to the ancient faith as one that had "deluged your island in blood, and dispersed impiety, bigotry, persecution, murder, and rebellion, through every part of the world." The principal author of that document was John Jay, the future first Chief Justice of the United States and it was passed by the First Continental Congress in 1774. Christians in Jerusalem’s Old City say their presence at the geographical heart of their faith is under threat from intimidation and aggressive property acquisition by hardline Jewish settlers. According to church leaders, priests are being verbally abused and spat at, and property vandalised. The churches say they are facing onslaught on three fronts: a war of attrition waged by hardline settlers; unprecedented tax demands by Jerusalem city council; and a proposal to allow the expropriation of church land sold to private developers. 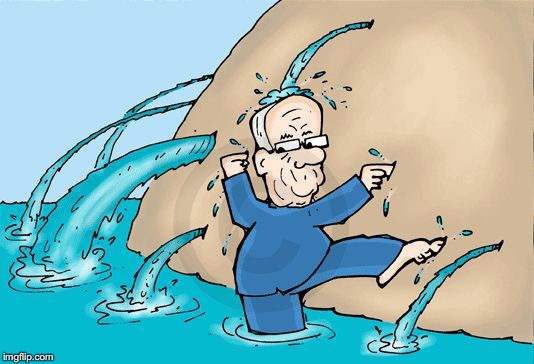 Theophilos III, the Greek Orthodox patriarch of Jerusalem and the most senior Christian leader in the Holy Land, told the Guardian: “Today the church faces a most severe threat at the hands of certain settler groups. The settlers are persistent in their attempts to erode the presence of the Christian community in Jerusalem. “These radical settler groups are highly organised. Over the last years we have witnessed the desecration and vandalism of an unprecedented number of churches and holy sites and receive growing numbers of reports from priests and local worshippers who have been assaulted and attacked. Theophilos has in the past few months travelled to the UK, the Vatican, the US and elsewhere to seek support for Christian institutions in the heart of the Holy Land. In the UK, he met Prince Charles, government ministers and Christian leaders, including the archbishops of Canterbury and Westminster and the Coptic archbishop of London. The patriarch wants a commitment to the continuation of the status quo, an agreement which provides protection of, and access to, holy sites in Jerusalem and elsewhere, allowing Christians to live and worship in peace despite the conflicts and divisions in the area. Pope Francis and other Christian leaders have called for the status quo to be respected. Last edited by wosbald on Wed May 02, 2018 11:42 am, edited 1 time in total. "Christ's mission to end poverty" say whut? I hope it was some staffer who screwed that one up for the bishop. NEW YORK — In the latest twist in an unfolding drama over the forced departure of the chaplain to the House of Representatives, Father Patrick Conroy, who resigned in March following pressure from House Speaker Paul Ryan, has now rescinded his resignation. Both Conroy and Ryan are Catholics. “It is my desire to serve as House Chaplain in this 115th United States Congress to the end of my current two-year term, and beyond, unless my services are officially terminated (however that is properly done) or I am not re-elected to the position by membership of the House,” wrote Conroy. According to Conroy, Burks also cited a prayer before Congress in November prior to debate on tax reform legislation as a reason for Ryan’s request. Conroy’s decision to rescind his resignation comes one day after Republican Congressman Walter Jones, a Catholic, sent Ryan a strongly worded letter questioning his decision and demanding that he reinstate the chaplain for the remaining eight months of his term. In a story with multiple updates late Thursday afternoon, Jesuit Fr. Pat Conroy rescinded his resignation as chaplain to the U.S. House of Representatives, House Speaker Paul Ryan changed his mind and decided to keep him in the position, and House Democratic Caucus Chairman Joe Crowley of New York called for an inquiry into the initial dismissal. In response, Catholic leaders are praising what seems to be a resolution after a week of controversy and conflicting reports of why the priest was asked to resign in the first place. “I am pleased that Father Conroy will remain as House Chaplain,” Rep. Linda Sánchez (D-Calif.) told NCR in an emailed statement, adding that Conroy’s service “has been a blessing” to House members. “We must work to keep the Chaplain’s office out of the political fray,” she added. Sánchez is one of more than 140 Catholics in the House, many of whom signed a letter asking for more information after it became public that Conroy’s resignation was not voluntary. So did Rep. Rosa DeLauro of New York, another Catholic and Democrat, who also praised Ryan’s dramatic reversal late Thursday. Ryan had continued to defend the priest’s dismissal throughout the past week. “Speaker Ryan did the right thing by refraining from further politicization of the Office of House Chaplain and reversing his decision to terminate Father Conroy,” DeLauro tweeted. Conroy “has carried out his duties with dignity and commitment, and has never wavered in his strong pastoral presence on behalf of the entire House of Representatives,” she said in the tweet. Thursday’s story began with the release of Conroy’s letter to Ryan, in which the priest rescinded his resignation, saying he believed the speaker had no cause to oust him. 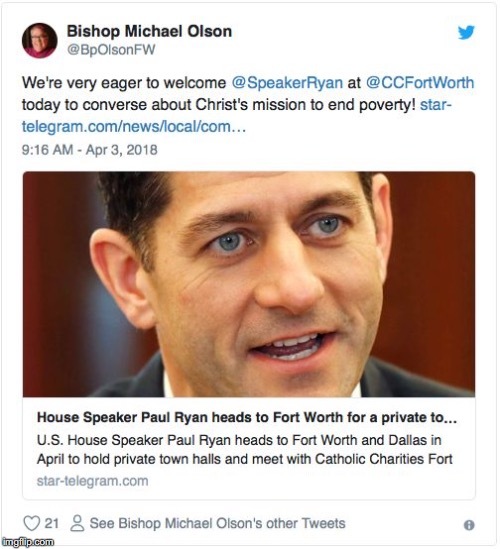 As nearly as I can tell, some folks close to Speaker Ryan figured that it would be timely PR to retire the Catholic chaplain who has been there for many years and replace him with an Evangelical pastor of some sort. A political move? -- Of course. This is Congress, after all. A big deal? -- not likely, by any stretch. But there are always trouble-makers, looking to make a big deal out of nothing. Since Speaker Ryan's home district is close to Madison, a local paper is stirring the crap.